A Royal Marine fell to his death during a helicopter abseiling exercise, the Ministry of Defence (MoD) has said. L/Cpl Gordon Campbell, 28, from Oldmeldrum, Aberdeenshire, died while "fast roping" at the Pontrilas Army Training Area near Hereford on Monday. The parents of the marine, nicknamed "Gordy", were on holiday in China when they received the news of his death. 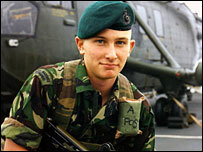 He was based at Poole, Dorset, and had joined the Royal Marines in 1997. West Mercia Police are investigating. L/Cpl Campbell, a member of the Royal Marines Assault Group, had served in Kosovo, Northern Ireland, Iraq and Afghanistan. His commanding officer said he had a "natural flair for soldiering". "As an individual he will be remembered as a fun-loving, generous, selfless and impressive man with a passion for Manchester United. "A loyal and dependable man, he has been a fine ambassador for the Royal Marines. He will be sorely missed." A police spokesman said: "West Mercia Police can confirm that on Monday a member of the armed forces, who was taking part in an exercise, suffered injuries which led to his death. "In accordance with national protocol, an investigation into the death is being dealt with by West Mercia Police."